A "Puritan mindset in The Scarlet Letter" research paper reports that Hawthorne uses the child to further indict the Puritan mindset, as the townspeople’s attitudes towards mother and child are keenly felt. Have a custom written research completed for you on the Puritan mindset in the Scarlet Letter by Nathial Hawthorne. “The little Puritans…scorned them in their hearts, and not infrequently reviled them with their tongues. Pearl felt the sentiments, and requited it with the bitterest hatred that can be supposed to rankle in a childish bosom”. It is not that Pearl is a hellcat or wild child. The episodes of Pearl being surrounded by sunlight show that she has been freed from narrow-mindedness and oppressive rules. “Pearl set forth…and…did actually catch the sunshine, and stood laughing in the midst of it, all brightened by its splendor”. The sun disappears when Hester steps into it because the mother is still caught in the Puritan prison. From the beginning, Pearl is aware of the scarlet letter on her mother’s breast, in chapter 6, the infant Pearl catches sight of the gold embroidery and reaches a hand to grasp the letter “smiling, not doubtfully, but with a decided gleam” which causes Hester to tear away from the child “so infinite was the torture inflicted by the intelligent touch…”. Pearl’s attention returns to the letter time and time again “like the stroke of sudden death. Pearl serves as a constant reminder to Hester of her “sin,” even more so than the piece of cloth sewn onto her clothing. After a time, it mould be possible for Hester to forget the letter, to have grown so accustomed to its presence that she might forget it, but Pearl is a living and breathing constant reminder, continually pointing out Hester’s shame. Hawthorne creates three very different characters in The Scarlet Letter. Each of these characters are guided by their personal desires, agendas, strengths and weaknesses. The character of Chillingworth provokes nothing but negative feelings. While Hester and Dimmesdale possess redeeming qualities, Chillingworth possesses none. 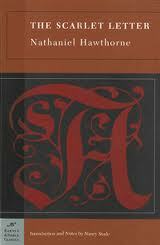 By way of these three characters Hawthorne draws a clear distinction between sin and evil. If Hester and Dimmesdale represent sin in the novel Roger Chillingworth clearly demonstrates pure evil. The first hint at Chillingworth’s character is given by his appearance. His shoulders are deformed, with one rising above the other. It is this deformity that makes him stand out in the crowd and makes him obvious to Hester from her vantage point of shame. This deformity also serves as a clue to the reader that like his body, Chillingworth houses a deformed soul as well. Chillingworth is consistently portrayed in the novel as a cunning, calculating man with no capacity for human warmth. When he was with Hester he acted in ways to diminish her self-worth and to accentuate his power and authority over her. Throughout the book he is on a continual pursuit of knowledge. However, he does not seek knowledge as a way to help others or himself. Instead he views it as a means to further his plans for revenge. As his name suggests he is a cold, calculating individual who places no value on emotion other than hatred. Chillingworth’s actions clearly distinguish him as a person who is evil rather than one who merely commits a series of sins due to the weakness of human nature. On the most basic level this distinction is made clear when the motives of the major characters are revealed. Hester and Dimmesdale both sinned, yet their sin was committed out of love. Chillingworth on the other hand acts solely out of hate and the disregard of human feelings. For example, he conducts medical experiments that border on the edge of murder in order to satisfy his own selfish needs. Symbolism in The Scarlet Letter - Symbolism in The Scarlett Letter research papers focus on exactly what the letter represents to the characters in the novel. Maypole of Merry Mount - Explication essay on Nathaniel Hawthorne's the Maypole of Merry Mount. The House of Seven - The House of Seven Gables research papers analyze Nathaniel Hawthorne's novel The House of Seven Gables. Faces of Evil - Dr. Jekyll and Mr Hyde by Nathaniel Hawthorne; My mind still clung to the image of my wife. A thought crossed my mind: I didn't know if she were still alive. Paper Masters writes custom research papers on Puritan Mindset in The Scarlet Letter and overview Hawthorne's The Scarlett Letter through research and writing.